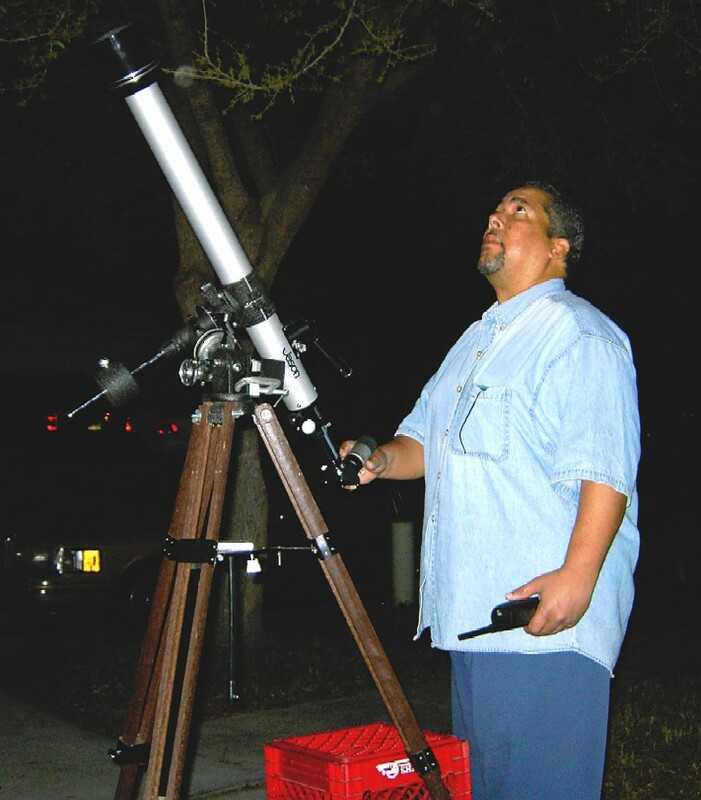 Mel Dawson in Riverview, FL with his clock driven 60mm f/15 Jason 313 Discoverer refractor as he looks upward at the moon in Cancer during the ‘over-the-phone’ joint observing session with VSC founder Gary Barabino in Waggamans, LA. The photo was captured at 12:38am EDT on March 17, 2008. On Saturday afternoon (03-15-2008), Gary Barabino proposed partaking in a joint observing session on Sunday night with our 60mm f/15 Jason 313 Discoverer refractor telescopes. The idea brought back many a memory of the times we spent using our meager 60mm scopes back in the late 1970’s when we both lived in the Desire Housing Projects in New Orleans, LA. I relished the thought and was eager to oblige. In preparation for the event, on Sunday evening (03-16-2008), I prepped my 60mm refractor to make certain everything was in order. Upon inspection, the optics looked good and clean, so I decided to do some exterior cosmetic work. There was a light layer of dust on the instrument, but nothing major. It was easily removed with a slightly damp terry cloth towel. As I was cleaning the scope, it hit me to try one of my battery powered clock drives on the 313’s equatorial mount. 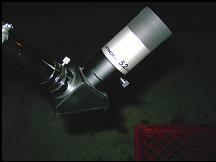 In my garage I spotted one attached to my 4.5” Cosmos Newtonian and quickly relieved the reflector of it. In attaching the drive to it, I had to do some rigging. Though the flexible connector on the clock drive fit the worm gear shaft on the Jason perfectly, the bracket used to attach it to the scope securely did not. So I instilled a 7/8 thick chunk of Teflon (a remnant from the construction of my 10” f/5.6 Fork Mounted Newtonian Reflector) to aid in bracing the drive’s bracket to the equatorial mount as perpendicular to position of the clock drive’s shaft as possible. Once installed, I flipped the drive on and Eureka!!! It worked! Now I was ready to bring the telescope out to acclimate it. Once the Jason was placed outside and aligned with the north celestial pole, I gave Gary a call on his cell at around 10:30pm EDT. He said he was on his way home from his son’s house (Gary Jr.) after installing a ceiling fan and would be home shortly to setup his 313. In the meantime, my telescope was acclimated in short time and at around 10:50pm EDT, I was set to observe. First, I would like to point out that though the sky was clear, there was a heavy haze to it. Winds were out of the east at about 13 miles per hour with gusts close to 20. Despite the brisk breezes, I held fast to performing the session. The temperature was 62 degrees, and the humidity was about 70%. The haze along with a glaring gibbous moon absorbed much of the light from stars below 3rd magnitude. It was definitely not the sort of night to do any deep sky object viewing. As I waited for Gary’s call, I commenced my observing session. The first object of choice was the waxing gibbous moon. Using my .965” to 1.250” hybrid star diagonal to utilize some of the finer oculars in my repertoire, I first pulled out the 25mm 1.250” Olivon Kellner, which yield about 36x power. I am still not certain if this eyepiece is actually of the Olivon brand, but it looks just like the 2” version (Olivon Stratosphere) of oculars being sold by them. I placed the eyepiece in the diagonal and took a gander. The moon looked fantastic as it loomed in the constellation Cancer, despite the skies haziness. 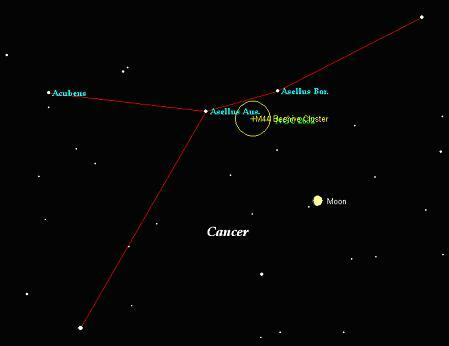 Here is an image showing the moons position in the early morning hours of 03-17-2008 using Meade’s AutoStar Suite. Located in the constellation Cancer, the moon intensified the glow of the haze across the entire sky. Deep sky object viewing was shut down. I could easily make out many of the moon’s prominent namesakes such as the large crater Clavius, brilliant Tycho, and the symmetrical Copernicus. After a short while I increased the magnification slightly to 45x power bringing out even more detail with my William Optics 20mm WA eyepiece. Then it crossed my mind to try my hand at capturing a few photos of the lunar surface. The camera I uses was a Gateway DC-T50 5-mega pixel point and shoot digital. But, before I got starting with imaging, I pulled out some big guns to further increase the magnification. This time I took aim using my University Optics 12mm Koenig. Though it dimmed the moons image a great deal, the details were sharp. It generated a power of 75x. Simply outstanding! And the clock drive was working perfectly! After some virtual flybys of the moon’s surface at the 75x power magnification, it was time to try out some photography. At around 11:00pm EDT, I gathered the photography equipment. As mentioned earlier, I used my Gateway DC-T50 digital camera. To connect it to the Jason 313, I used my homemade wooden universal camera adapter. The eyepiece selected was the William Optics 20mm WA eyepiece I initially started my observing session with. With the eyepiece firmly grappled within the clamp of the adapter, the camera was then attached to its bracket and then centered at the rear of the ocular. I was not sure if the clock drive was going to pull the scope and the adapter, but it trucked along just fine after it was attached to the telescope. The moon was coerced into the field of the view of the William Optics 20mm WA eyepiece, and was visible in the LCD display at the rear of the DC-T50 camera. Then the drive was activated after securing the equatorial mounts axis’ lock bolts. The camera was set to AUTO mode and the 3x optical zoom fully engaged. I focused the image within the camera’s display until it was as sharp as possible. The image actually filled the entire display screen without showing the field edge of the eyepiece! Great, no cropping needed, I thought to myself. So with the scope pointed at the southern most region containing craters Clavius, and Tycho, I began snapping shots at 11:14pm EDT. The photo session continued until Gary called, which was about 11:30pm EDT. Additional photos of the northern region of the moon that include Mares Tranquillitatus, and Serenitatis, plus the crater Plato were taken as I spoke with Gary over the phone. I have included some images in this report. Lunar imaging concluded at 11:44pm EDT. So, Gary and I continued to do some visual observing through the Jason 313’s and using our collection of TeleVue Plossls. The first one we used from the set was the 20mm, which gave 46x power. Gary was first to put it to use as I was still breaking down the universal camera adapter. Gary yelled out the infamous “Look at that” phrase we have used countless times when our scopes performed beyond our initial expectations. He began describing how sharp the image was especially around the crater Clavius. Then, I finally got out my 20mm TeleVue Plossl and placed it in the hybrid star diagonal of my Jason 313. The view was awesome, but before I knew it, Gary had switched over to the TeleVue 8mm Plossl, yielding114x power and was awestruck at the near color free images the optical combination attained. Catching up with “Bam” by installing my TV 8mm PL, we began sweeping the lunar surface in search of the smallest discernable features describing our views as we went along. I looked closely at the crater Clavius and was able to see approximately eleven small craters in its central plateau region with this eyepiece. Gary reported seeing more as he also included craters he saw impacted into the sloped sides of Clavius. Man! These 313’s were working wonderfully. Then Gary said he was switching to the 83x power of the 11mm TV Plossl, and before I knew it, “Bam” was expressing how there was not a spec of Chromatic Aberration in the image! Just a few moments behind Gary, I placed the same eyepiece into my 313 and the results were the same. I saw even more detail in this eyepiece than with the 8mm. My overall conclusion is that Towa (makers of “Circle T” brand optics) adhered to very stringent manufacturing standards during the time these telescopes were being built. In our tests and observing enjoyment, we pretty much saw very similar results from each of the eyepieces we used in unison. I must say that if you were looking for identical quality in an equivalent telescope at today’s standards, you would be hard pressed. They just do not make them this way anymore for low-end department store telescopes being sold today. 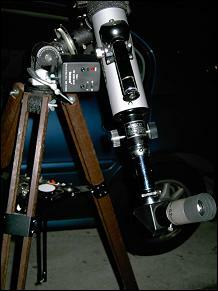 Photos showing the Jason 313 Discoverer refractor setup with the Orion 5.2mm Lanthanum eyepiece. The ocular performed well on the moon - not so good on the planets, especially Mars. The photo on the left shows the improvised attachment of the Tasco battery powered equatorial clock drive. It worked quite well! The observing session continued with us now pulling out the nuclear bombs to get a closer look at the moon. This time we chose to try an even shorter focal length eyepiece within the auspicious Lanthanum family. I used my Orion 5.2mm Lanthanum, while Gary pulled out his Vixen LV Lanthanum 4mm. They both produced powers of 217x and 227x, respectively, pushing the telescopes well beyond their theoretical limit. The lunar surface looked rather well with little to no CA, and was relatively sharp. But, the moon appeared much dimmer. As I swept the scope near the lunar terminator, I picked up Copernicus. I could easily note the array of three mountain peaks at its center; one small mountain flanked by to larger ones. The symmetry of the 50-mile diameter crater is assuredly one of the moon’s most beautiful appendages. Copernicus’ ray system beautifully embellished part of the huge plateau of Oceanus Procellarum. And the Apennine Mountains rendered dynamic relief to the lower plains. Muted by the sun’s intense rays was the infamous lunar crater grouping of Alphonsus, Arzachel, and Ptolemaeus, as well as the lesser group of Theophillus, Cyrillus, and Catharina. They all looked fantastic though this small aperture instrument! Three regional images of the Gibbous Moon as take through my Jason 313 Discoverer Refractor with a William Optics 20mm WA eyepiece. 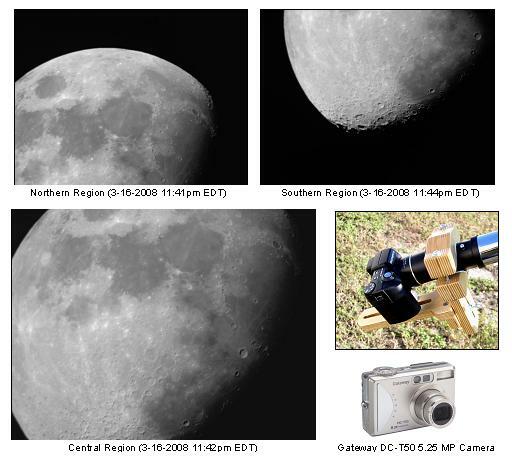 My homemade Universal Camera Adapter (middle-right image) held the eyepiece and Gateway DC-T50 5 mega pixel camera (lower-right image) quit effectively. Click here to view an enlarged view of the Northern Lunar Region image. Click here to view an enlarged view of the Central Lunar Region image. Click here to view an enlarged view of the Southern Lunar Region image. Saturn’s position in the constellation Leo during the morning of 03-17-2008 as portrayed by the Meade AutoStar Suite software. Moving on in great anticipation, we aimed our instruments at the ringed planet Saturn. It was past midnight EDT, and Saturn was near the meridian. Using a lower powered TeleVue Plossl to easily capture the planet into the field of view, we then switched over to our 8mm TeleVue Plossl, which rendered a power of 114x. Though the eye relief was a bit tight (about 6mm), Saturn snapped crisply into view. I could definitely see the polar darkening at its pole, a few belts, distinct shadows cast by the planet’s disk onto the rings, and the ring’s shadow cast upon the planets disk. Gary was expressing the same. Cassini’s Division was ever present, but the haze of the earth’s atmosphere along with the moons glow reduced contrast tremendously. Titan flanked the planet to the southwest at a distance of about four and a half Saturnian disk diameters. 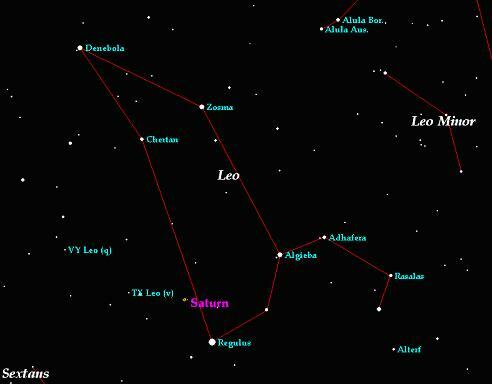 At this time and date, Saturn is in the constellation Leo, a few degrees east of Alpha Leonis (Regulus). A diagram depicting Saturn’s location in the Lion asterism can be seen above as rendered by Meade AutoStar Suite software. After relishing the view for a while with the 8mm eyepiece, I wanted to do something out of the ordinary. I grabbed my Orion 5.2mm Lanthanum (217x) and put it to use on the planet. Because of the limitations of the small objective in the Jason 313, I knew the planet was not going to appear favorably. But, to be honest, it showed better then I had imagined. I could not get a tack sharp focus, but I could still make out some of the most profound detail, such as the shadows mentioned earlier. Plus I could still see Titan! I could almost sense that the optics was crying from the strain. I wonder how Saturn would have appeared in this telescope with the Orion 5.2 Lanthanum when it was at opposition back on February 24th of this year. Hmmm! Mars, as he sits near the left foot of Castor, one of the twins in the constellation Gemini. 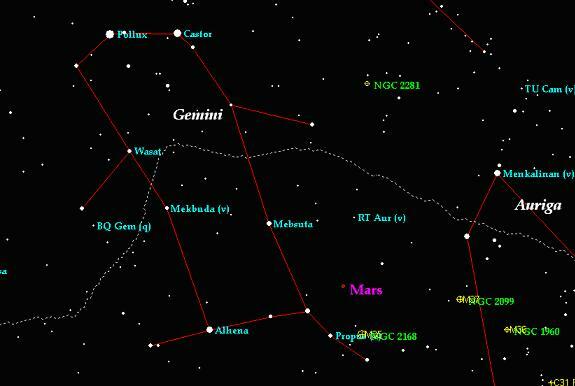 Mars continues to move away from the earth after a splendid opposition back on December 24, 2007. As we neared the end of our observing session, Mars was our next target subject. It was now after 1:00am EDT, and the winds and haze continued to play havoc with my observing pleasure and equipment. Gary reported that a few clouds were moving in, and he was close to calling it a night because he had a doctor’s appointment later in the morning. But, we managed to take in a few views of the Red Planet before we called it quits. As the planet dropped lower in the western sky, we trained our Jason’s on it using our TeleVue 20mm oculars. As you already know, the power manifested on this scope by this eyepiece was 46x power. Not particularly a striking image to behold. But, I could make out the fact that the planet projected a gibbous phase. That was about it. So, will increase the power by using our TeleVue 8mm eyepiece at 114x power. Still not esthetically pleasing, yet I could just make out a small dark patch on its surface, and a slightly bright tip where the polar cap resided. Since Mars was approaching the western horizon, a pinch of Chromatic Aberration was being introduced. I figured this was being caused by the light of Mars hitting the upper atmosphere of the earth at an obtuse angle, which causes a slight prismatic effect. This refractive property appears to affect Mars more than any of the other planets observed at this angle. Mars is definitely best viewed when it is near or at the zenith.